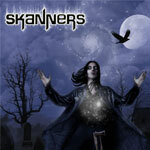 They've only got five studio albums under there belt and they might not be a household name, but Skanners has been around since the mid-eighties. You might have seen them advertised as Italy's Judas Priest and if you listen to their latest release you'll know why - 'The Serial Healer' sounds like a collection of lost 'Painkiller' recordings. Not only could frontman Claudio Pisoni probably win any Rob Halford sound-a-like contest, but many of the riffs and vocal harmonies bring you back to the days when many consider Priest to be at their best. Loyal Halfordians should especially appreciate 'The Serial Healer.' Pisoni's tones, screams, and delivery are not only undeniably inspired by Halford, but make him sound like he could have been Halford's long lost twin. You really have to remind yourself more times than not that this is not Rob at the mic. It's almost eerie. Skanners gets docked a few points for originality, or lack thereof. I normally don't like bands that mimic others (not even my favorites like in this case) but there is something instantly appealing about these guys. It might be the rich production, the quality songwriting, or the world-class musicianship, but whatever the case this is a strong album that is sure to fire up diehard Priest fans everywhere. If you've had the jones for a good 'Painkiller' sounding CD 'The Serial Healer' should definitely satisfy your craving. I normally don't like bands that mimic others (not even my favorites like in this case) but there is something instantly appealing about Skanners. It might be the rich production, the quality songwriting, or the world-class musicianship, but whatever the case this is a strong album that is sure to fire up diehard Priest fans everywhere.